Okay – I didn’t realize I would have to rotate the photos before I loaded them, so you’ll have to crank your head 90 degrees until (or if) I get a chance to fix them. Sorry bout that! We started to another sunny morning today. It was fairly cold overnight, but It quickly warmed up as the sun rose in the sky. It was the first morning in a very long time that I didn’t need leggings. We found a lovely lakeshore road to take for the first 16 kms, before we had to jump back onto the Trans Canada. Today was the day we had been waiting for. It was sunny all day, and we had our first taste of a tail wind in 3 weeks. It was light, and more of a cross-breeze, and we were more than happy to take it! It made the cycling quicker and easier than we had anticipated. We met an interesting young man when we stopped for lunch. 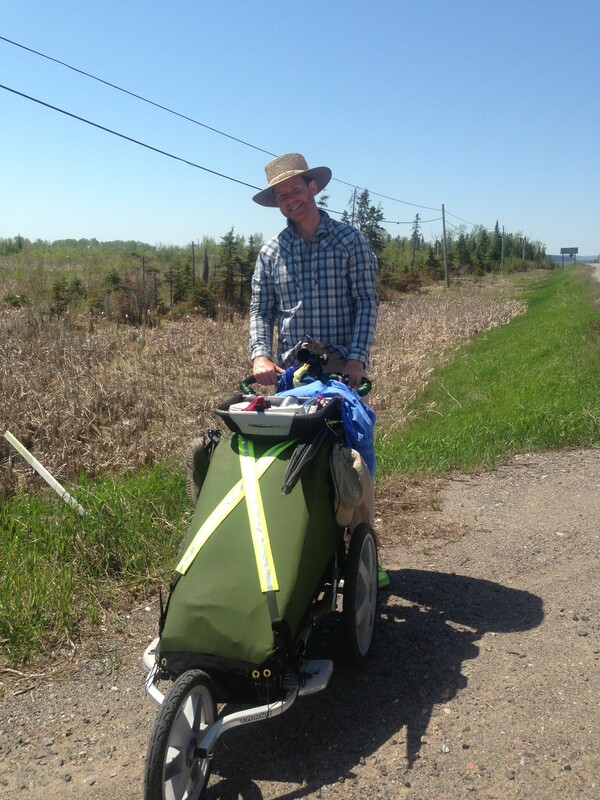 Shawn is walking from Thunder Bay to St. John’s NL. He said he was inspired by an article on some women elders who were walking around the Great Lakes to raise awareness about water conservation. He also was intrigued by Jean Beliveau, a man from Quebec who walked around the world over an 11 year period. He joined us for lunch, as he said one of his goals was to accept any hospitality that was given to him by strangers. 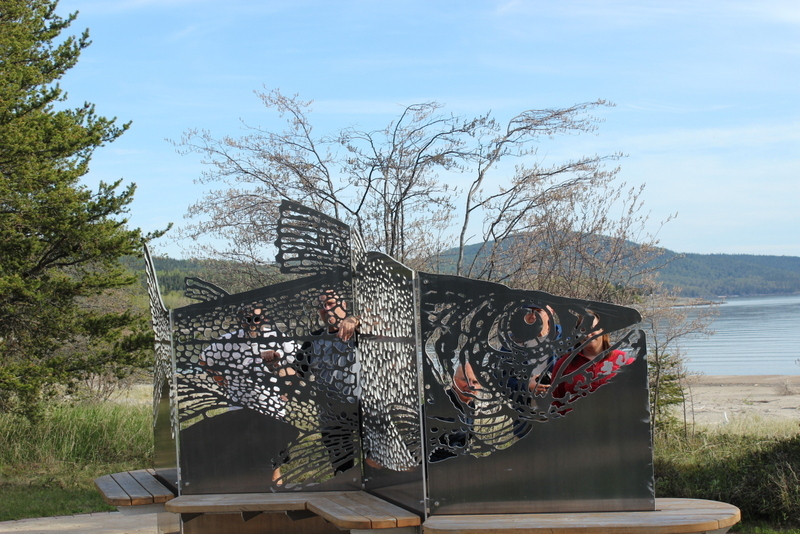 We arrived very early to our RV stop near Nipigon because of the great conditions, and we knew we had long days coming up, so we decided to press forward, and take our chances finding another RV park. We stopped at a Timmy’s for some sustenance (one frozen lemonade for me now, one for the freezer to have at the end of the day! ), and then continued onward. 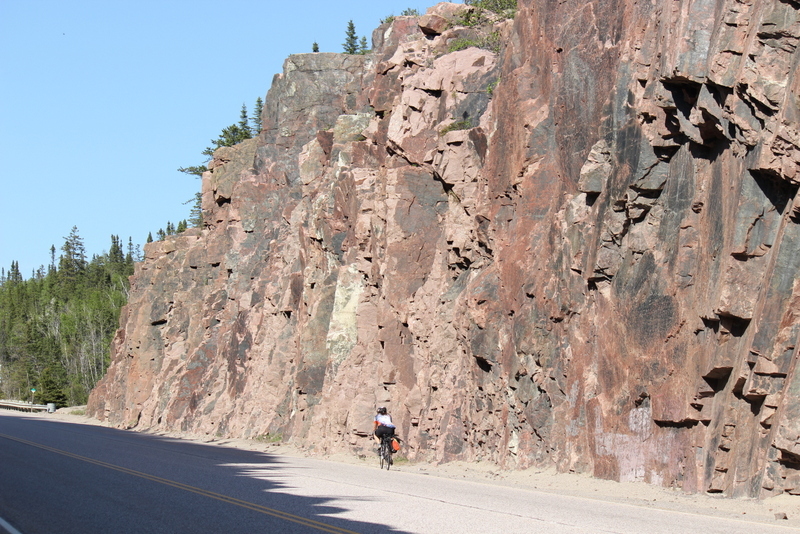 One of the key features of this area was the beautiful red rock. Not only was it surrounding the highway, but also gave the lake rocks on the beaches a pink hue. And still the only wildlife for me (if you can call it that) was a dead moose on the side of the road. 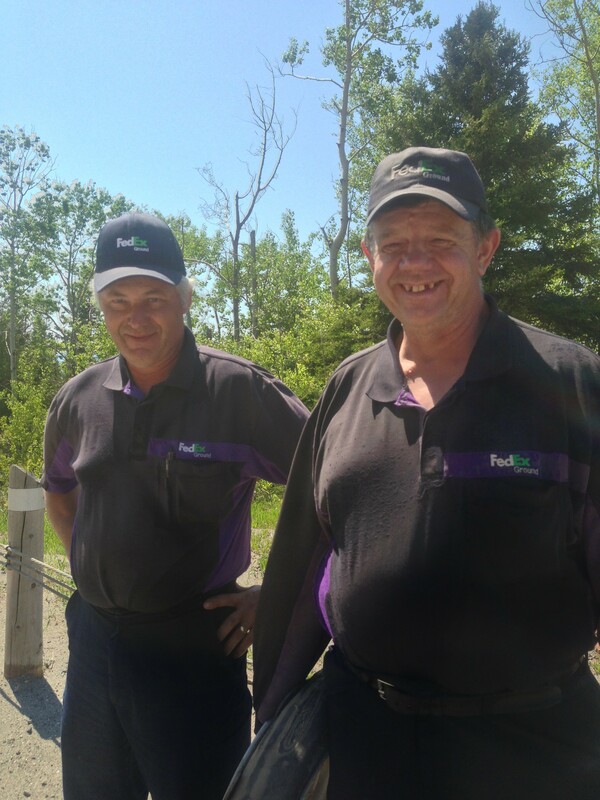 We met up with Herman and Ben, who drive a FedEx truck back and forth from Winnipeg to Toronto twice per week. As we spoke about mental health issues, Herman shared a heartbreaking story of his neighbor who lost both a daughter and a son to suicide. It really is an epidemic. 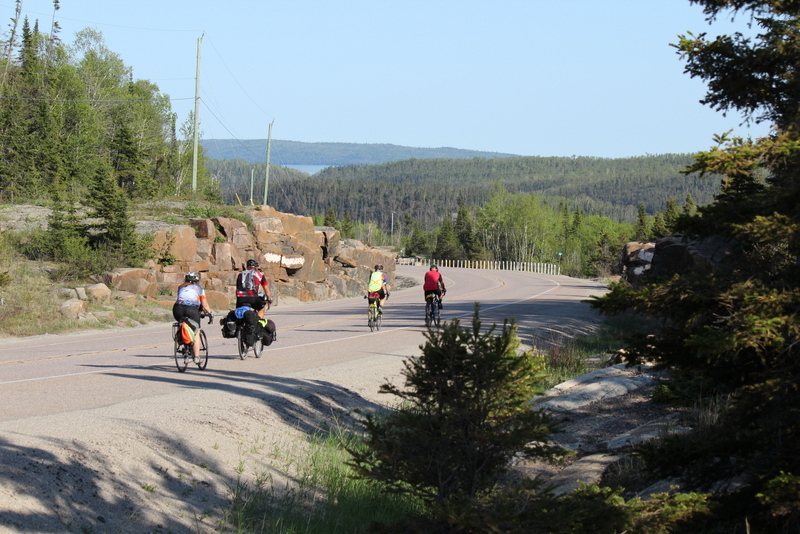 We looked and looked, but didn’t come across a campground until Rainbow Falls Provincial Park, after Rossport. This made it our longest day – 178 kms, with a bunch of longer hills right near the end of the ride after about 140 kms. We didn’t get into camp until around 6:30 pm. It still wasn’t as hard as the Hope-Princeton day, because although some of the hills were steep, they weren’t near as endless. We ate late, almost 7:00, and were really happy to have the chili that Terry had made on our day off in Thunder Bay. We had it frozen in case of a long day, and this definitely qualified. I scrambled to get a blog up, as I didn’t expect to have such a long day, and then deservedly hit the hay. Today was a very eventful day. Weather was again great, minimal headwind, but it wasn’t the elements that got us today. Right about lunchtime, we stopped at the RV as it was pulled over at the side of the road for a rest break. I heard the familiar hissing sound of a tire going flat, but this time it wasn’t a bike tire. It was one of the inside tires on the RV’s double axle. 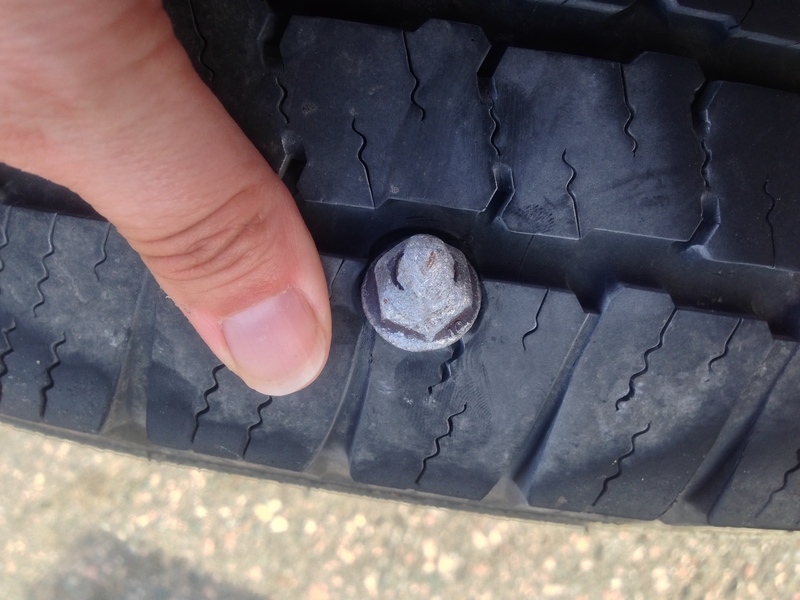 And with my hand I could feel something about the size of my thumb impaled into the tread of the tire. After unsuccessfully trying to get cell coverage to our RV rental company, we asked a helpful trucker what he suggested. 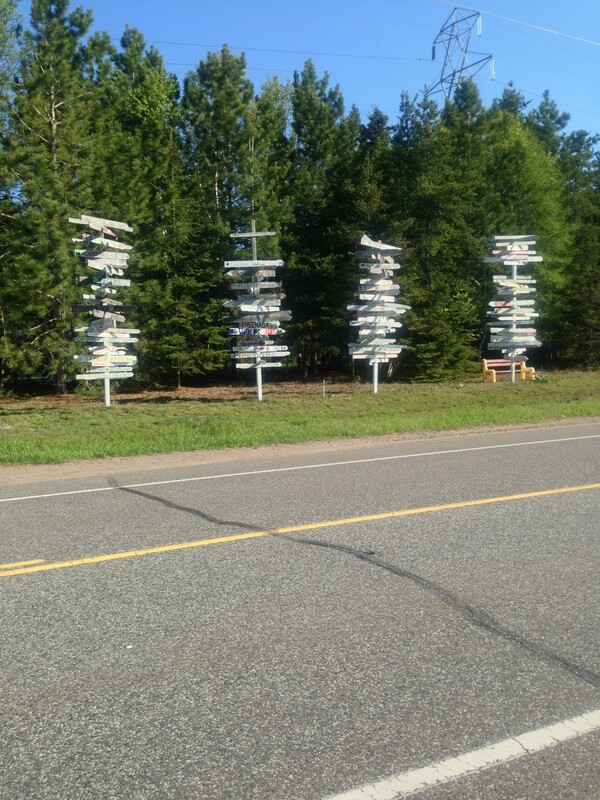 We ended up driving slowly, at about 60 km/hr, until we got to a place with phone service. After investigating several options, which were limited because it was a Sunday, we lucked out that Terry had RV coverage with AMA. 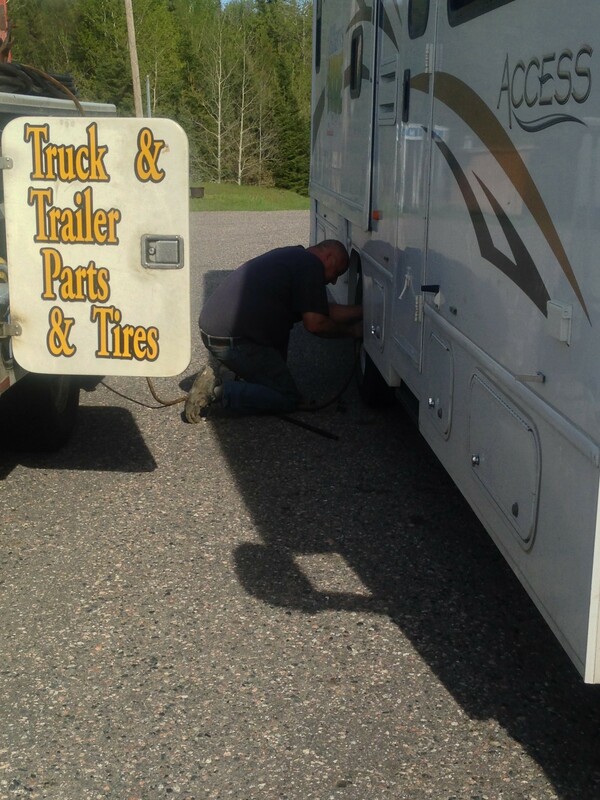 So someone came from Nipigon, over 2 hours away, to change the tire and put on our spare. We will take in the tire tomorrow to be fixed in Marathon. We had a good conversation with Naomi, the mechanic’s girlfriend, and Elaine and her family, who were visiting from Winnipeg and were in our campground. We had an early dinner at Ney’s Lunch, who stayed open until 6:00 pm for us, and had burgers which was the main staple of the menu. We met Danilita from the west coast, who had a brother who died of suicide 2 years ago. He had suffered from anxiety disorder since he was young, and had managed to work at a profession for many years before the breakdown of his marriage triggered a deep depression and he ended his life. I was glad to hear that her family could speak openly about it and support each other – that makes such a huge difference in the healing process. And I finally saw my first live moose today, on the shoulder of the road. Before I could get a picture, he was scared away by a semi (luckily for him) and headed back to the bush. 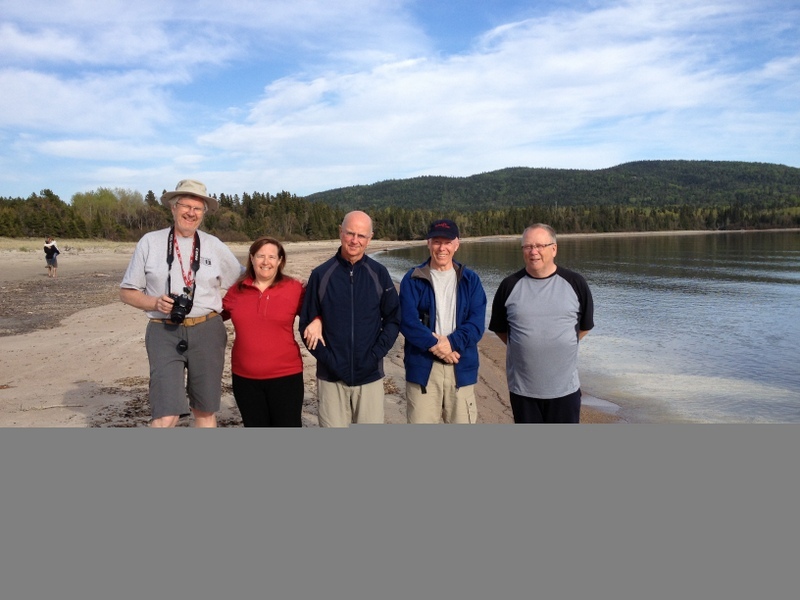 We took an after-dinner walk along Lake Superior, to enjoy the beautiful views. To quote Forrest Gump, it was “hard to tell where heaven ended and earth began”. We’re gearing up for tomorrow, as the forecast says there is a chance of rain……. Keep up the good work, Sue. You are doing a wonderful job, all of you. Great updates and photos, ~ what an inspiring journey!